A documentary from the Knights of Columbus profiles several individuals who have been touched by the message of Divine Mercy. An extraordinary new film on the message of Divine Mercy has just been released. Funded by the Knights of Columbus, it is a timely addition to the many excellent Catholic documentaries now emerging. In it we meet a woman who found freedom in forgiveness after seeing her family wiped out by genocide; a former-NFL linebacker who walked away from football to share Christ’s mercy with the homeless; a baseball player who traded MLB ambitions for the monastery; a priest with a drug-dealing past; and a young widow who chose mercy over hatred for her husband’s killer. These testimonies remind us that Divine Mercy is not just a devotion of the past or some abstract theology—it is alive, it is present, and it transforms the world. Narrated by Jim Caviezel, The Face of Mercy explores the history and relevance of Divine Mercy in our turbulent times. The film seamlessly weaves together theology and history with moving modern testimonials to create a remarkable portrait of the Face of Mercy in today’s world. CWR recently caught up with the film’s producer, David Naglieri. CWR: Where did the idea come from for The Face of Mercy? David Naglieri: We were inspired by Pope Francis’ call for the Jubilee Year of Mercy and for the Church to focus itself in a new way on its mission to be merciful. At the same time we have been supporting the special project at the St. John Paul II National Shrine in Washington, DC, and we realized that the exhibit would benefit from a film detailing the strong history and connection between St. John Paul II, St. Faustina, and the Divine Mercy message. Working closely with the Congregation of the Sisters of Our Lady of Mercy we were able to gain unique access to key sites in the life of St. Faustina, including the home of her birth and access to the original diary of Faustina. The film’s ultimate goal was to help educate and inspire audiences about the impact the message of mercy revealed to St. Faustina has had on both John Paul II and Pope Francis, as well as on the individuals with powerful testimonies profiled in our documentary. CWR: How long did it take from conception to completion? Naglieri: We first filmed in Poland in October 2015 and the film was released in October 2016. It essentially took one year from beginning to completion. CWR: How difficult was it to find funding? Naglieri: The film was funded and produced by the Supreme Council of the Knights of Columbus. CWR: The contributions on screen are incredibly powerful. How did you find the participants, and how do they feel about the finished film? Naglieri: Early in the project Sr. Gaudia Skass, who co-produced the film with me, had the marvelous insight to tell the story of mercy through the testimony of individuals, juxtaposed against the powerful symbolism within the image of Divine Mercy. This would allow viewers to grasp simultaneously the intricacies of the revelation to Faustina while being inspired by a contemporary witness to mercy. I think this insight is what in the end made our film a success, but it did necessitate going out and finding these witnesses. I began doing research to find the right testimonies. I had heard Father Calloway’s testimony of turning away from a life of drug addiction and crime to follow Christ, and I knew he would be a perfect addition to our film. Immaculee Ilibagiza and Steven McDonald are iconic figures and well-known authors and speakers on the importance of forgiveness and mercy. I met both Frater Matthew Desme and Eric Mahl at a retreat held by Catholic Athletes for Christ, where they both spoke on topic of Divine Mercy. A friend introduced me to the story of Jennifer Trapuzzano, whose public forgiveness of her husband’s murderer garnered headlines in her home city of Indianapolis. Jennifer has a powerful message and we were thrilled to be able to find her and include her in our film. CWR: Your contributors discuss not just powerful experiences but intensely painful ones. How difficult was this to capture on film? Naglieri: We did our homework and we found witnesses who were incredibly articulate and who had deeply reflected on the events that occurred in their lives in light of their faith and the merciful message of God. The fact that many of these individuals had already spoken of their suffering in other public settings gave them a certain comfort level. Our approach was to give them as much time as they needed and to allow them to share the complete story without an over-emphasis on the hard moments. What emerged was a natural telling of the story and the heartfelt moments of suffering revealed in context and with authenticity. CWR: What has been the general reaction to The Face of Mercy? Naglieri: I have been really pleased with the reaction. Viewers have been moved by the testimonies and we have been receiving numerous requests from viewers who are looking to obtain a DVD to share with their parishes or prayer groups, because the film so deeply impacted them. Positive feedback on social media and word-of-mouth since the airings began on television networks have also spread the word about our film. CWR: Is it true the film has been aired on a major American television network? Naglieri: Yes, The Face of Mercy was chosen for distribution on ABC TV-affiliated stations from October 16 to December 16, 2016 through a partnership with the Interfaith Broadcasting Commission (IBC). In existence since 1980, the IBC is a cooperative venture of America’s Abrahamic faith communities—a broad coalition of Protestant, Catholic and Orthodox Christians, Jewish and Muslim organizations—in partnership with ABC, CBS, and NBC and their affiliated stations nationwide. Regarded as a primary source for faith based network programs, the IBC represents mainstream religion in our society, affirms the integrity of each other’s faith perspective, and helps television in particular and mass media in general to exercise their societal and public service responsibilities. CWR: Has it aired in Poland? Naglieri: The film has not aired in Poland as of yet. CWR: What future plans are there for the film? Naglieri: We are excited to have our premiere on EWTN on January 29, 2017, and the film will then be made available digitally on iTunes and Amazon Prime. We are also hoping for a deal with Netflix. We will continue to market the DVD, which is distributed by Ignatius Press and is available at faceofmercyfilm.com. CWR: What part do you think films such as The Face of Mercy have in the New Evangelization? Naglieri: The New Evangelization calls each of us to be formed in the faith and to be witnesses to the ends of the earth. In his apostolic exhortation Evangelii Gaudium (“The Joy of the Gospel”), Pope Francis renewed this call for a new missionary spirit among Catholics. For the Knights of Columbus, initiatives such as producing The Face of Mercy is a way for us to answer that call to help form Catholics with a better understanding of the beauty of their own faith and its incredibly rich history. At the same time the film gives a platform to already formed instruments of the New Evangelization to proclaim to a wider, secular audience the power of the Gospel to transform lives. 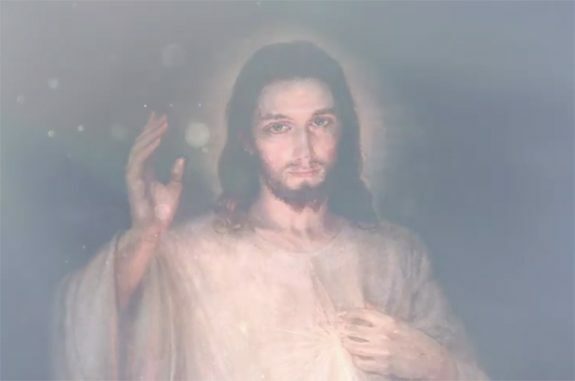 Thus, it is our hope and prayer that The Face of Mercy can serve the New Evangelization both by helping strengthen Catholics who perhaps lack an awareness of the Divine Mercy message, and also introduce secular audiences to the Gospel.